So only 6 horses in the Preakness! That has to be the shortest field in a long time. Kind of glad of it really, a nice change from the stampede of the Derby. 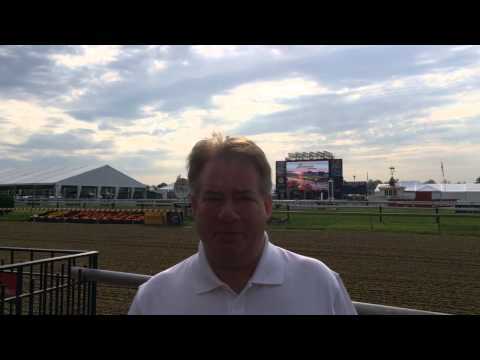 @KMM yes I am going to be making another game for the Preakness. I just need a field before the game can start. Right now I know that American Pharoah, Diving Rod, Dortmund, and Firing Line are pointed towards the Preakness. I just need the other horses. Danzig Moon, Bodhisattva, Tale of Verve, and (possibly) Grand Bili are listed as contenders on the Preakness website. We'll know for sure after the post draw. Grand Bili is listed as "pending"; the others are "confirmed." weirdness for sure. just wow. That's weird. And isnt it up to the owners what races they do and don't race in. Oh, it may be chatter from owner and breeder. From what I read, did not seem so controversial. But I may have missed the owner / trainer main exchange. Fill me in guys in what I missed. There may be rain for Preakness. Do we have any successful mudders in lime up? American Pharoah won in the slop in the Rebel. Good to know. He may indeed have it all things considered. Not only won. Every impressively. It`s a must watch to get the feel for this horses talent. I read about this earlier! I was wondering if I kept reading everything wrong.... Guess I'm not incorrect. But the more I think about it, the weirder it gets: is D. Wayne Lukas going SENILE or something?? He cannot possibly be ignorant enough to defy the wishes of Mr. Z's owners and go on running the Preakness with a horse that CLEARLY needs a break. Did not get opinion from content. what am I missing?, trainer's son made some of comments. Enlighten me. I must be missing something. @Casey, you're well acquainted with the Zayats: do you have any idea what's going on with this?? This is very out of character for D. Wayne Lukas, who is a well respected trainer..... But maybe not, after this stunt. I read an article about it earlier (can't remember where exactly - Bloodhorse maybe? ), but DWL had a quote that said he hasn't actually discussed it with Zayat yet, which I find hard to believe, but that he's confident he'll run. Wasn't Zayat's alternative running Mr. Z on turf a week or two after the Preakness? Still not much of a break if it's true. Uh oh...divining rod is starting to give me the spooks. Are you afraid there will be another Barbaro incident? Or it will just remind you of it? My local papers are running articles that claim Pharoah was completely wasted at the end of the Derby. I didn't get that impression. Instead I am reminded that Secretariat had a very small field in the Preakness. Not saying Pharoah is as great as Secretariat. Just saying he might be intimidating some owners or trainers because they think he's good. The reason there's such a small field in the Preakness is because EVERYONE knows that they have the best chance at beating American Pharaoh with a fresh horse at a distance his pedigree and running style shouldn't be able to get. The Preakness should be relatively easy for American Pharaoh, but he should still keep on his toes.... As Firing Line is an intimidating adversary, and Dortmund does well at shorter distances.